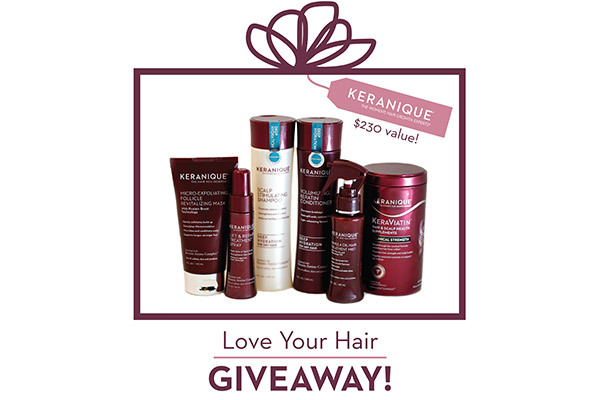 We’re looking to share GREAT hair with ten of YOU as part of our Keranique Love Your Hair Giveaway! This Friday, we will be randomly selecting ten (10) of our followers on social media to win $230 worth of products. Win six of our most popular haircare products to nourish and strengthen your way to happy, healthy hair and the confidence you deserve! So what do you have to do? You have two chances to enter, once on Facebook and once on Instagram. Just follow us on each platform, and let your friends know about the contest! Comment on this post and tag TWO (2) friends who you think would love Keranique, too! Winners announced on Friday, September 28th at 3pm EST / 12pm PST by random selection. One (1) entry per person allowed on Instagram and one (1) entry per person allowed on Facebook, for a total of two (2) entries per person.